In this, his best-known work, the controversial American economist and social critic Thorstein Veblen appropriates Darwin's theory of evolution to analyze the modern industrial system. 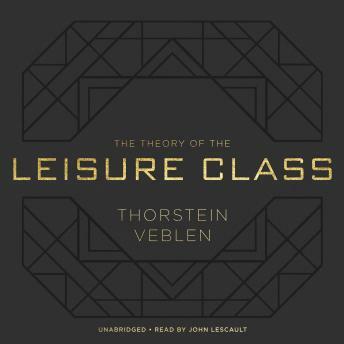 For Veblen, the shallowness and superficiality observed in society results from the tendency to believe that true accomplishment lies in arriving at a condition of ostentatious wealth and status. In developing his thesis, Veblen traces the origins and development of ownership and property, offering extraordinary insights into consumerism, the evolution of class structure, the rise of leisure time, and how modern societal goals are grounded in monetary aspirations and achievements.With a cool gaze and devastating wit, Veblen examines the human cost paid when social institutions are founded on the consumption of unessential goods for the sake of personal profit. Fashion, beauty, sports, the home, the clergy, scholars-all are assessed for their true usefulness and found wanting. Indeed, Veblen's critique covers all aspects of modern life from dress, class, industry, business, and home decoration to religion, scholarship, education, and the position of women, laying bare the hollowness of many cherished standards of taste and culture.The targets of Veblen's brilliant, scathing satire are as evident today as they were when this classic of economic and social theory was first published, and his book still has the power to shock and enlighten.